I was trying to read The New York Times online, but I suffered momentary ADD when I was distracted by an image of a bespectacled middle age male model in a shirt ad sporting an utterly ridiculous Justin Bieber-style haircut. This made me wonder if there was a picture of a bespectacled Justin Bieber out there so I did a Google search to appease my curiosity. Sure enough, there he was, the tween heartthrob and his mother’s retirement plan, wearing utterly ridiculous oversized spectacles. 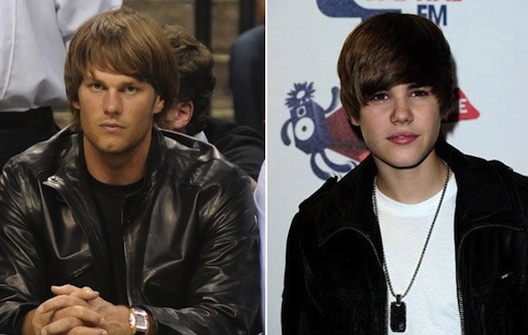 Even New York Patriot’s quarterback, Tom Brady, took some heat when he appeared to be wearing Bieber-inspired locks. Body beautiful Brady would have made an infinitely more attractive cotton shirt model. 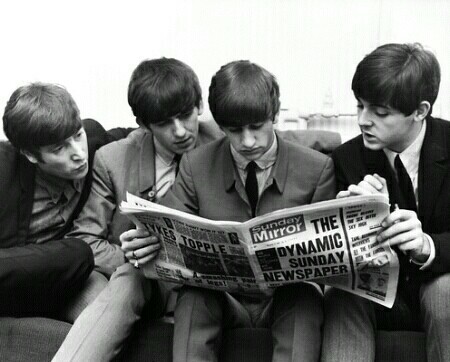 The Fab Four and Arthur. I WOULD STAB THIS KID IN THE HEAD WIT A MILLION WATERBOTTLES….. When a 102 pound 16-year-old falsetto is influencing how men’s shirts are sold, this confirms that the planet is overheating in the worst way. If Mad Men’s Don Draper were an actual retired 80-something ad man living in today’s world, and he had not succumbed to lung cancer, cirrhosis of the liver, or a massive coronary while getting horizontal with someone other than his wife, seeing ads like Cotton Work would have surely provided the tipping point that makes him happy to check out in 2010. This entry was posted in Humor and tagged justin bieber, men's hair, the beatles, tom brady. Bookmark the permalink.